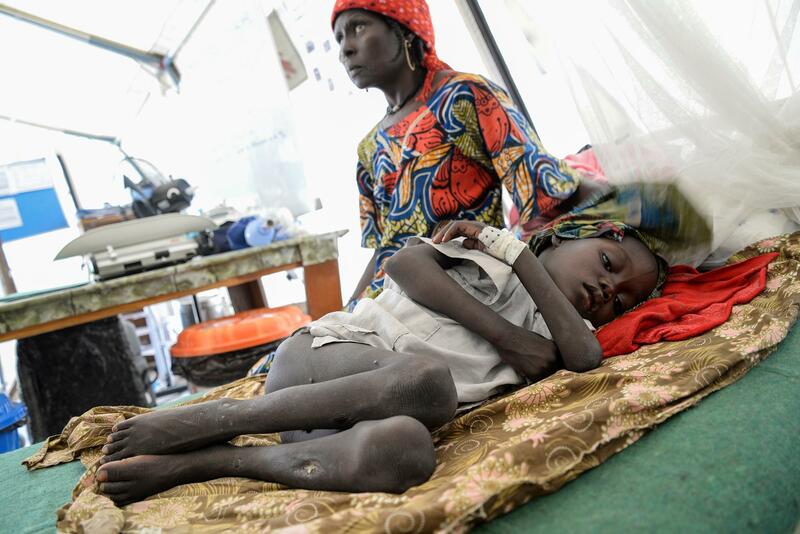 Nigeria: "I’m so glad MSF is here, you can see lives being saved"
We’re very busy at the moment. We’re seeing around 60 malnourished children each day in the feeding centre – all under the age of 10. I’ve worked with malnutrition before, but what I find striking here is that there are so many malnourished infants. Often their mothers have died in childbirth and there’s nobody to breastfeed them, or their mothers have fled from Boko Haram and are so traumatised that their milk supply has been affected. MSF international president Dr Joanne Liu and Dr Laura Heavey discuss a patient on the daily round in our feeding centre. Maiduguri, February 2017. Maiduguri is one of the safer places in northeastern Nigeria, which means that people fleeing Boko Haram and fighting in surrounding areas have flocked to find sanctuary here. There are more than one million displaced people living here in cramped and overcrowded conditions. Add to that malnutrition, and you’ve got the ideal conditions for tuberculosis (TB) to spread. "You can see lives being saved"
When one four-year-old boy came to us, he couldn’t swallow, couldn’t eat and couldn’t even sit up. He was so unwell that we didn’t think he would make it. We put him on oxygen and started TB treatment. Within five days, he was off the oxygen, and within a week he was eating, drinking and trying to climb out of bed. Every day he’d demand in his little, hoarse voice that we take him outside so he could play with the goats. Within a few weeks he was well enough to go home. I saw him again last week when he strolled into the feeding centre looking like a completely normal four-year-old. That was really satisfying. "I always remind myself that we have more children walking out of the hospital than dying here." Watching a malnourished child recover is like watching someone come back from the dead. When they arrive, they’re so weak it’s like their bodies and brains have shut down as they try to conserve energy. Initially they just lie there, apathetic. But you give them antibiotics and you start some feeding and you slowly see their energy returning. They start sitting up, then they start smiling, and then that natural playfulness that children have suddenly returns, and you can tickle them and they make faces at you. It’s such a moving thing to witness. I’m so glad that MSF is here doing this work. You can see lives are being saved. Map of MSF's activities in Borno State, Nigeria. You have to focus on the positives. When I went home to Ireland for a break, I remember looking at all these Irish kids, thinking, ‘My God, they’re so fat!’ But they weren’t – they were just healthy. I’d got so used to seeing bony arms and stick legs and nine-month-old babies weighing 3 kg that it had become normal for me. To keep perspective, I always remind myself that we have more children walking out of the hospital than dying here. Every day I make sure I spend time out of the intensive care unit and the feeding centre and go instead to the transition tent. This is where the children stay who are almost ready to leave the hospital. They are always happy and playful, and I just spend time with them, blowing up balloons, having a laugh. It’s important. You never get used to seeing children die from preventable illnesses. A lot of children here have sickle-cell disease, which is a disorder that affects the red blood cells and which requires recurrent blood transfusions. "The real challenge for many people will occur in April when their harvested food runs out." Children with the disorder are more prone to infections. We just had an 18-month girl in who was desperately ill with it. We quickly got the blood for cross-matching and started the transfusion, but it was too late. She stopped breathing and died of heart failure as we treated her. You keep thinking: if only she’d got to the hospital a few hours earlier… if only her condition had been diagnosed before... But the conflict has destroyed healthcare in so many places. Mothers wait for their malnourished children to be seen by a nutritionist at the MSF clinic in Banki. Boko Haram has destroyed farms and crops and has disrupted health services for years. We see a lot of children with measles, whooping cough and pneumonia because it’s been too dangerous to do proper vaccination programmes in many areas. People with medical conditions haven’t been followed up. It’s a bad situation. MSF has been doing food distributions in Maiduguri for quite a while, and that's not something we normally do. The real challenge for many people will occur in April when their harvested food runs out. We’ve been preparing for that: we have enough beds and our staff are well-trained. I’m confident that we’re ready if the crisis gets worse. Amina weighs just 7.2 kg. Here, she's treated at our feeding centre in Gwange, Maiduguri. People who come to us are surprised when we tell them that the care MSF provides is completely free. They’re incredibly grateful, as health costs can be catastrophic. If they spend their month's budget on one child getting better, how will they be able to feed their other children for the rest of the month? You can see the relief when they find out that they don't have to pay for care – they don't have to worry about how many days their child is in hospital, they don’t have to count the cost of the medications or the oxygen. They can just relax and wait until their child gets better.